Dr. Chandan, FRICS, took the lecturn for a guest lecture for the Thursday, November 18th class of RES\FIN 9776. Dr. Sam Chandan is the global chief economist and executive vice president of Real Capital Analytics and an adjunct professor of real estate at Wharton. The Zicklin School at Baruch has the honor of having him as a visiting scholar. Dr. Chandan, a dynamic speaker, queried the packed room with the questions about their involvement in real estate. Having sized up the eclectic audience of newcomers and seasoned professionals, he launched into his presentation. Dr. Chandan started with the obvious. Job growth is weak even though some technicrats declared the recession over some time ago. The dismal state of growth is certainly not a point lost on this audience, but it served as a touchstone throughout the presentation. It’s the key fundamental that drives commercial real estate. He stepped into this section by cautioning that there is much more to the numbers — his stock and trade. While useful, the data are biased. In particular, these numbers skew towards public companies (e.g. REITs) that disclose their data. More over, the data (e.g. vacancy rates) are biased towards to higher-end properties in major markets and their CBDs. Unlike the previous recession, currently the supply side of the curve has not moved. He commented that the profound job losses shifted the demand curve inward dramatically for office space. The central theme of jobs underscored his point about the state the industry. The growth of income and the number of employed will drive any recovery. There is activity, our speaker commented, but it’s still very distressed. The proper valuation of properties remains a high obstacle. Price discovery is still very difficult. There are waiting games on the part of buyers until more people default, but that is not happening at the extent expected. “Extend and pretend” is confusing the market, but banks see it as mitigating their losses. There is a potential for heavy losses if banks act aggressively to foreclose and hence the workouts and modification. Regulators have allowed the practice to continue to help the industry return to health. Politicians care because if commericial real estate is managed well then the regional banks will stay well funded. These banks are the primary channels for credit to small business who do most of the hiring — back to jobs again. 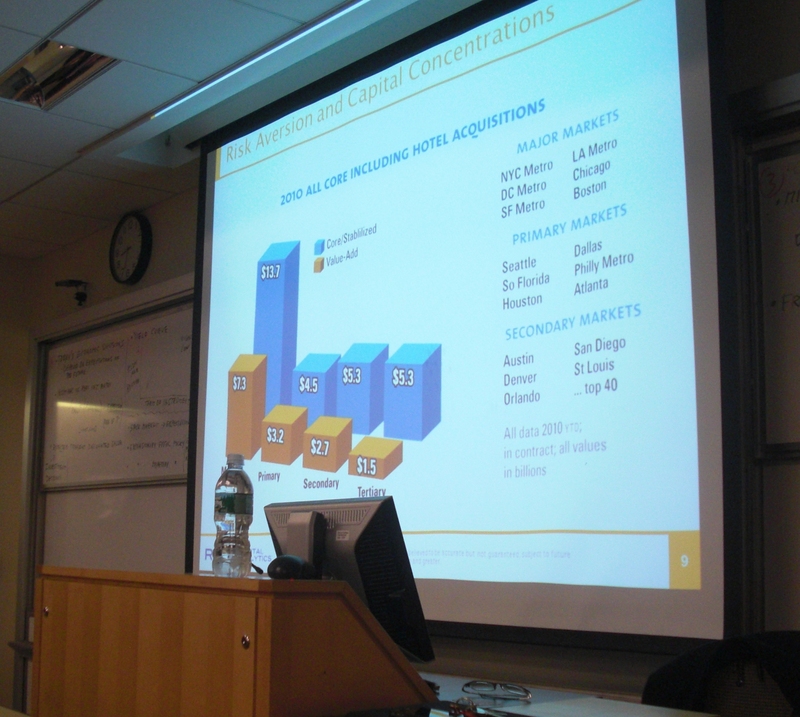 Dr. Chandan offered more caution about major markets: NYC, DC, San Fran, LA, Chicago and Boston. These areas have the benefit of additional liquidity due to the large number of domestic and international buyers in combination with the high concentration of lenders. A deeper look and one can see a herd mentality in these markets developing and thus upward pressure on valuation. The spillover effect to other markets is not happenenng because long-term operating fundamentals still don’t look appropriate. With time drawing to a close, Dr. Chandan ended the discussion with his take on a recovery. Fannie and Freddie MAC — where will these institutions end up? Welcome to the Zicklin School of Business at Baruch Dr. Chandan. Thank you for an engaging presentation and insightful look at the real estate industry. Now if we can only do something about that tie of yours! You can find more information about Dr. Chandan’s company here.